-The Indian diaspora is second only to China -though the Chinese figure of 35 million arguably also includes that of HongKong and Taiwan, which when not included, could be lesser than the Indian figure! - A World Bank report points out that India receives the highest remittance ($55Billion), followed by China ($51 Bn), Mexiso ($22.6 Bn), Philippines ($21.3Bn) and France ($15.9 Bn). 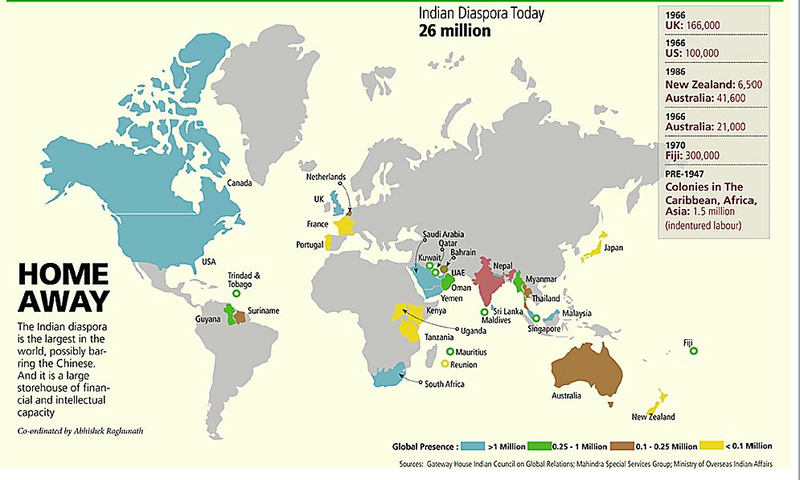 -There is an increasing interest in what makes the Indian diaspora tick! Family-centered. Large population. Large English speaking population. Massive cash outflows/inflows. Entrepreneurial disposition? -While Indians form less than 1% of the population in the US, but the share of the Indian graduate student population is 13%. Also the average household income for Indians in the US is reportedly $90,000 compared to the same of the general population is $50,000! There are also indications that as the Indian economy registers growth, thousands return to India amidst growing employment and investment opportunities. Any guesses on what the impact could be? wow indian diaspora to go :D way ahead! India is beginning to gain the inhabitants of their country.